PREMIUM 2 BR, 2 BA CONDO – GREAT FRISCO LOCATION, VIEWS – ON SHUTTLE ROUTE The brand-new Frisco Sports Chalet condominiums are conveniently located on Main Street, just a five-minute walk from Main Street’s shops and restaurants. 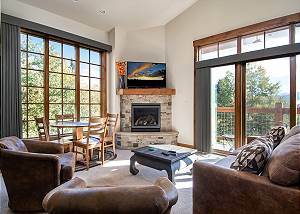 With a ski shuttle stop at the entrance to the complex and trailhead access directly across Main Street, these tastefully appointed vacation retreats offer direct access to year-round fun in Summit County! This beautiful 2-bedroom, 2-bathroom vacation home is filled with natural light and surrounded by majestic mountain views; it's perfect for families or groups of up to eight people. Enter the condo and kick off your boots, hang up your jacket and get ready to simply enjoy. Gather around the kitchen island where the culinarily inspired can delight in cooking with state of the art appliances in this mountain retreat. After dinner, relax in the cozy living area where you can watch your favorite movies or shows on the large screen LCD TV as you snuggle by the fire. For an added bonus, escape upstairs to the roof top deck, where you can enjoy spectacular panoramic views from Mount Royal to Lake Dillon! In addition to fantastic living spaces, this home boasts two nicely appointed suites. It’s the perfect destination for a family or two couples to share with a two-car heated garage, mud room, ski storage and laundry room, as well as complimentary Wi-Fi throughout. If you’re looking for a fresh, luxurious space in Frisco with convenient access to all the fun Summit County has to offer, the Frisco Sports Chalet has it all! Call us today to learn more or reserve your stay in this breathtaking mountain retreat. SLEEPS 8: UPPER LEVEL: - Access to rooftop deck. MAIN LEVEL: - King master suite: king bed, private bathroom with jetted soaking tub and walk-in tile shower, LCD TV. - Queen suite: queen bed, bunk bed, shared bathroom with living area with tub/shower. - Living area: queen sleeper sofa. SPECIAL UNIT NOTES – PLEASE READ: - No Pets/Smoking. - A $350 refundable damage deposit will be charged to credit card at check in. - Renters must be a minimum of 25 years old. - Parking: 2-car garage – 2 spaces total. - No air conditioning. All units include at least one fan.